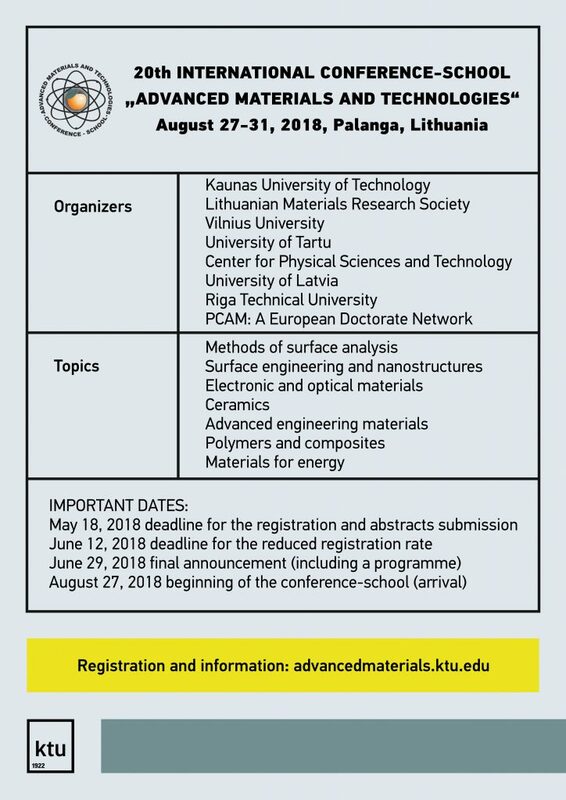 21st International Conference–School "Advanced Materials and Technologies"
Dear Colleagues, it will be a pleasure for us to meet you at the 21st International Conference-School “Advanced Materials and Technologies”, which will be held on 19th-23rd of August, 2019 in Palanga, Lithuania. The conference is organized by Kaunas University of Technology, Lithuanian Materials Research Society, Kaunas Science and Technology Park, Vilnius University, University of Latvia, Riga Technical University, University of Tartu, Center for Physical Sciences and Technology and University of Southern Denmark. The lectures will be presented by specialists from Belarus, Israel, France, Italy, Finland, Russia, Lithuania, United States of America and Australia. Participants will have the opportunity to present their work in the poster session. The deadline for registration and abstract submission is 12th of May, 2019.